With those two sources as my starting point, I set out to do my design. I had to guess on the base parts, with no measurements. After struggling with all those curved surfaces in Sketchup, I decided to lay it out with full scale drawings, and then a full scale prototype using pine. 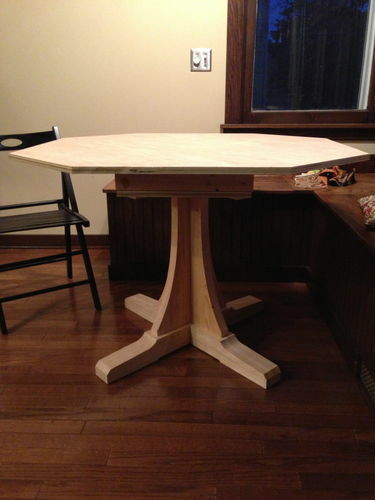 This process was great, and really helped me figure out how I was going to do the joinery, as well as having something full size to put in the space to determine the exactly table top size, height, etc. 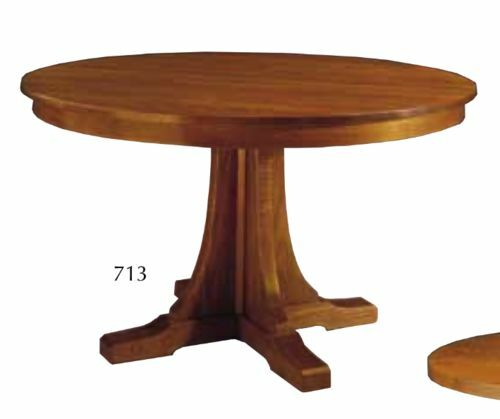 So I guess I’m doing the Stickley table with an octagonal top, more or less. The size and base shape as prototyped is perfect, but the hight is about 1” too low. I’m glad I went to the trouble to do this. I’ve ordered a pair of equalizer wooden slides and should be able to pick up the lumber next weekend. I am an enthusiastic hobbyest woodworker with a garage shop. I like Prairie/Crasftsman/Mission style furniture and details, as it matches my house. 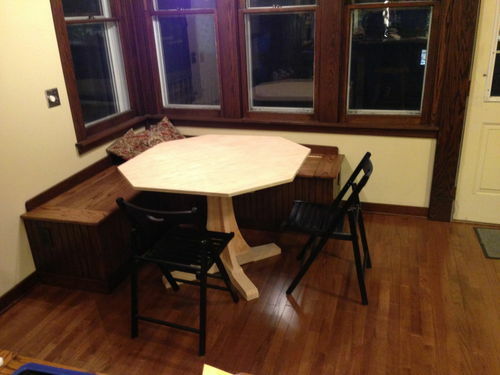 I think you did the correct thing by building a proto – table. Now it will pay big dividens. I did not check the height on a Night Stand and it should have been a inch taller. 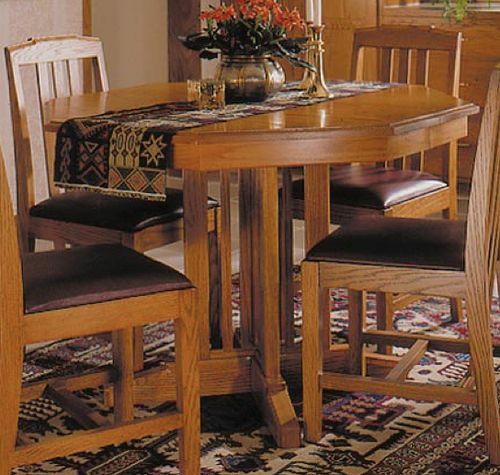 I like your design and I wish there were more places you could go to find good Arts & Craft Designs for furniture. The designs look simple, but you have be real carful because don’t cover up anything with moldings. 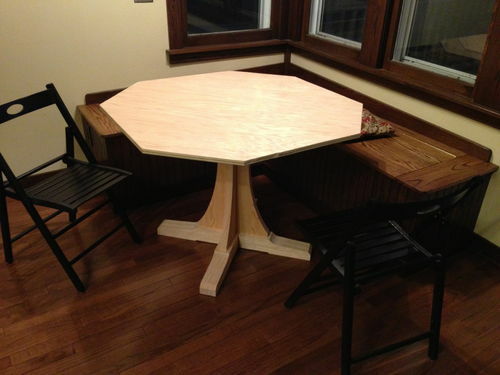 Have Fun building this table. I was wondering if you still have plans for the base in Sketchup? If you do would it possible for you to email it or add it the the 3D warehouse in sketchup. I don’t have any Sketchup plans for it. I started using Sketchup, but abandoned it to just make full scale template & mock ups. Otherwise, I would. Thanks for your quick reply. When you were making the feet for the base I see in one picture they looked like they were glued together before the feet were shaped. Did you cut each board to shape before you glued the boards together? For the feet, I laminated each of the two cross pieces together first, forming two chunky rectangles, then cut them to shape on the bandsaw, making the curves. I then cut the half-lap joint, and glued them to each other to form the “x”. Does that make sense? How did you make the mortises in the feet? Did you cut the mortises after you glued all the pieces of wood for the feet or did you cut the middle board in smaller pieces to make the mortise?